When I was a kid we used to eat scrambled eggs with flour all the time. We lived on a farm, which meant that we had more eggs than often needed, and this was a great way to use them up. 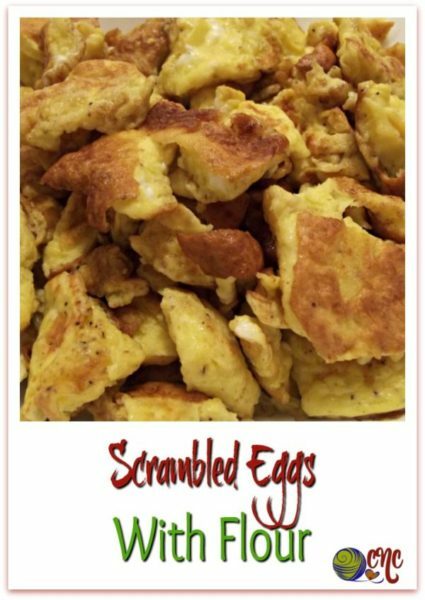 It is quick and easy to make, and is a simple, yet tasty alternative to your everyday scrambled eggs recipe. 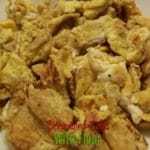 The flour gives the eggs a whole new flavor and texture that I’m sure you’ll enjoy. It’s also a good way to stretch the eggs if you’re on a budget. 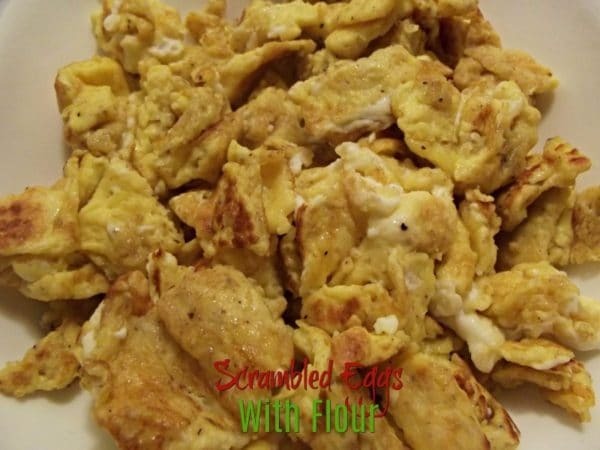 You can eat these scrambled eggs with flour any way that you like, just like regular scrambled eggs, such as with your morning toast and oatmeal or cereal. However, because we add the flour, we used to eat them instead of bread or tortillas whenever we had home-cooked pinto beans. 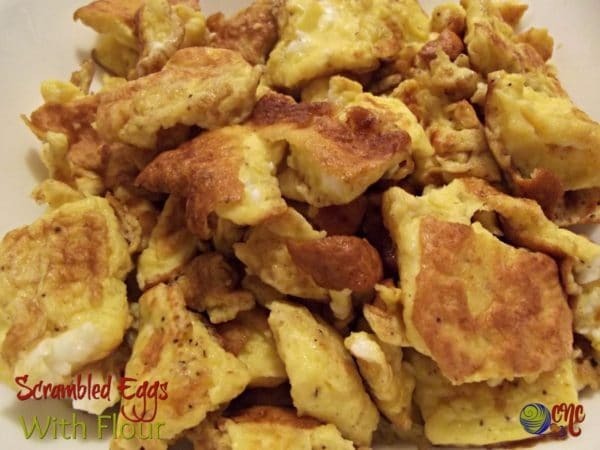 Anyhow, the best part about this eggs recipe is that it’s quick and easy to make. Cook them well as shown above, or cook them just long enough until they are set as shown below. This recipe is really easy to adjust according to your family’s needs. Simply adjust your number of eggs as needed, then for each egg you will need half a tablespoon each of flour and buttermilk. Then add salt and pepper to taste. It’s really that simple. And if you don’t have buttermilk, you can always use milk if you like. Add butter to medium sized frying pan and melt on medium to high heat. Meanwhile, whisk eggs into a small bowl. Add the rest of the ingredients and whisk again making sure to get all lumps out of the flour. Making sure pan is hot and evenly coated with the butter, pour the batter into the pan. Cook for about a minute or two before flipping. The bottom should be solid and begin to brown before you make the first flip. Let st for another 30-60 seconds. With spatula break the batter into pieces and begin to turn frequently to ensure everything gets cooked evenly. You want the eggs fully cooked, but not overcooked to the point where they lose the shine. Serve warm with your favorite breakfast foods such as cubed potatoes, hash browns or breakfast sausage. These scrambled eggs also go great with home cooked pinto beans.